So I've been thinking of a new way of blogging and I decided on something crazy: daily post for a whole month! I know, i know it's a big step and it's crazy but I just thought that this is a way of "daily vlogging" but not really. I guess I just want to put out content and share with you guys the things I've been experiencing/using mainly in the beauty sector because your girl here, has not been kind to her wallet and had some new items in. Basically, I'm going to declare the month of June to be the month of beauty products where every single day I would write about a post on a product I've been using and mostly loving! Every week will follow a theme and I will announce the theme on my twitter and instagram accounts so follow me on there if you haven't already! I get that this series may not be everyone's favourite but it is something that might help one or two of you to get some inspiration to give your beauty/skincare collection a little jazz up! This week will kick off with my favorite type of products - Eyeshadows! As you know, I'm an eyeshadow palette fanatic and I'm obsessed with anything with warm/pink tones and the occasional dust of glitter. Today's product that I will be telling you guys all about is the Tarte Toasted Palette! I was very lucky to to be gifted this palette for Christmas and it is by far one of my favorites just because of the range of colours. This palette currently goes for £41 but keep a look out for their sales because they do 20% off sometimes! If you know me, you'll know my all time to-go type of eye shadow colours are reds, oranges and pinks and this palette is basically the body of that! 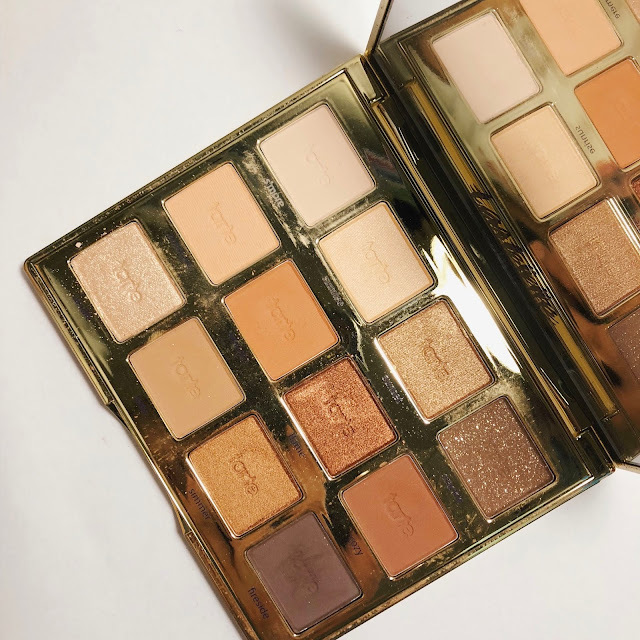 Plus, Tartelette palettes always have such amazing quality in the pigments and colour pay-off which is something I appreciate! No one enjoys having to go back to a pan two or three times just to get a colour to show up on their lids because its not only time consuming, it also takes up the extra effort to blend and all that stuff you know? This palette has a mix of shimmers, satins and glitter which is a good one when you're looking to experiment with different textures! As of late i've been loving the mattes but on some days when I want that little pop of extra something, something a spot of glitter on the middle of the eye lids won't harm no body! This may look a little strange to you because most swatches are done on arm and all that but I just wanted to try doing paper swatches because you can really see how the pigment is like! Although I must say, this palette has really impressed me because it was really easy to swatch these colours on and they are so buttery! Plus if possible I'd love to swatch this on different skin tones but one day, one day! 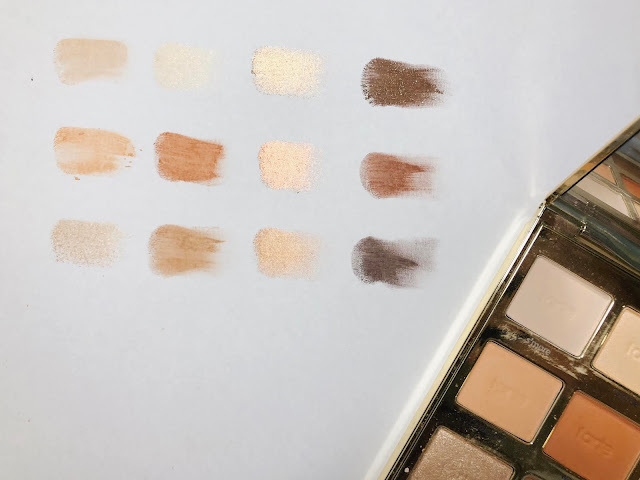 I've used this palette a couple of times and I think it's perfect for an everyday look but with the browns you can easily create a smokey eye should you want to go for an evening look! Some days where I just want a touch of colour, I'll just pick a shimmer shade and dab it all over my lids for just a quick and easy "eye look". I would highly recommend this palette if you want to play with the warm colours but still stay on the slightly safe sides just because the colours go with everything. You don't have to deliberately stay away from any shades such as blues or reds because they sometimes can come off too strong or too much for some people! Please let me know if you have this palette and what your favorite colours are! I hope you like this short little feature and do let me know if you have any specific products you'd like me to talk/swatch around so you can get to know it a little better too!